Canon also unveiled the RF mount, but you can use your current EF and EF-S lenses. Canon and Nikon protected their DSLR turf as long as possible, but Sony has been killing them lately with its mirrorless range. Nikon finally jumped into the fray by launching the Z6 and Z7 models, and today, Canon unveiled the $2,299 EOS R, a 30.3-megapixel video-centric full-frame mirrorless camera. 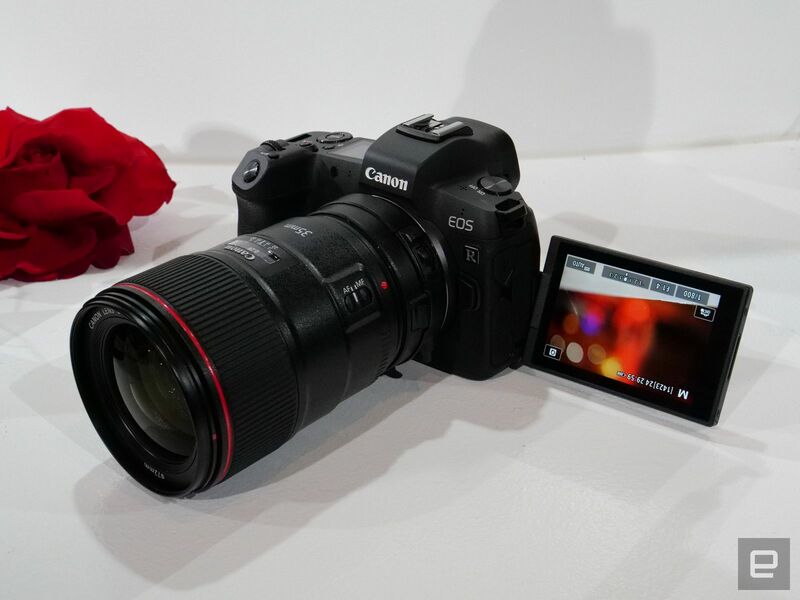 It also introduced a new lens mount, Canon RF, along with four lenses, including three interesting high-end "L" models. The EOS R slots between Sony's A7 III and A7R III and the Nikon Z6 and Z7, resolution-wise. It's a near match to Canon's own EOS 5D Mark IV DSLR, with similar resolution, dual-pixel autofocus, shooting speeds and video specifications. Suffice to say, this is a very important camera. Sony just overtook Canon and Nikon to become the best-selling full-frame camera brand in the US. And despite criticism around the autofocus system, Nikon's first-ever mirrorless models look very promising for both video and photography. Luckily, with its EOS R, Canon has made a strong full-frame mirrorless debut and beats rival Nikon in a few areas, but seriously falls down in others, especially video. Some Canon aficionados expected the EOS R to pack the same EF mount as its DSLRs. Luckily, in my opinion, the company didn't do that. While it means that EF-lens owners will need an adapter (more on that shortly), Canon was able to create a future-proof mount that will make for more interesting glass. Much like Nikon's Z-Mount, it has a large diameter with a short flange distance that allows for fast, sharp and compact lens designs. Canon unveiled the EOS R with four lenses, one more than the Z6 and Z7 had at launch. They are, I daresay, also more interesting than Nikon's Z-Mount models. 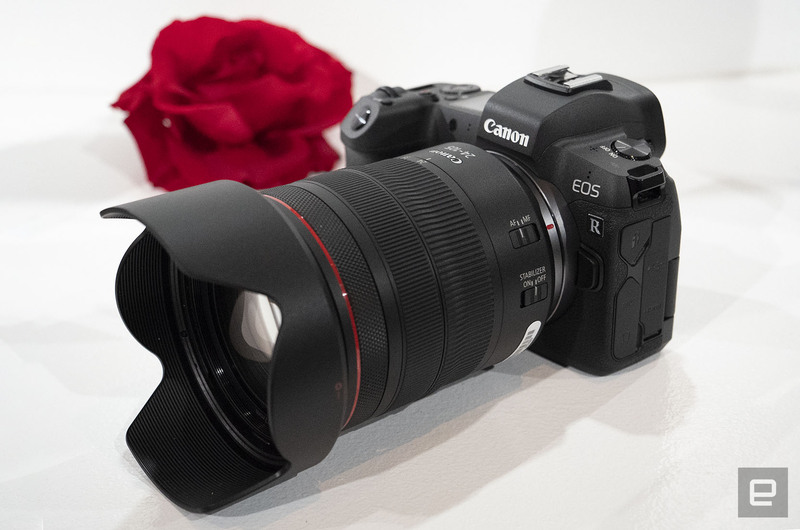 The first is the Canon RF 24-105mm f/4L IS USM model, a very solid kit lens for both photographers and videographers. There's a macro lens available right off the bat too: the RF 35mm f/1.8 IS STM Macro. At 35mm, it will do double-duty as a relatively inexpensive walking-around lens. The last two are the most interesting (and expensive). Canon's RF 28-70mm f/2L USM is an extremely fast zoom lens with a normal range that illustrates the power of the new mount. The company also launched a 50mm f/1.2 that's not quite as light-sensitive as Nikon's crazy f/0.95 Z-Noct, but it's still damn fast and will be available sooner. On top of the regular focus and zoom controls, each of the new lenses has a special new control ring. You can program it to change f-stop, shutter speed and other settings. The three new EF to RS lens adapters, meanwhile, will let you use any EF and even EF-S lenses (with a crop on the latter) with no loss in quality. You'll also get full autofocus, stabilization and metering capabilities, so you won't be left in the lurch if you already have a lot of Canon glass. Canon also introduced a lens adapters for drop in neutral density and other filters, and another with a control ring much like the one on the new RF lenses. All of those will let you use EF and EF-S lenses exactly as if they're on a 5D Mark IV or other DSLR, Canon promised. Unfortunately, because of the mount size (54mm with a 20mm flange distance), it will never be compatible with Canon's mirrorless APS-C EOS-M system. This will likely anger EOS-M owners, especially because Sony lets you use full-frame lenses on APS-C E-Mount cameras like the A6500, and E-Mount lenses on A7 cameras (albeit with cropping on the latter). While Nikon's Z6 and Z7 closely align with the resolution of Sony's 24-megapixel A7 III and 42.4-megapixel A7R III mirrorless cameras, Canon went for the middle ground with a 30.3 megapixel sensor. This is a wise choice in my opinion, as it makes the camera a more viable all-round video and photography camera. The sensor is very similar to the one on the 30.4-megapixel 5D Mark IV and, like that model, packs Canon's excellent Dual Pixel autofocus system. It's fair to say that the biggest disappointment with the Nikon Z6 and Z7 was the AF, which doesn't perform as well (so far) as the excellent system on Nikon's D850 DSLR. That said, we only had a brief time with the cameras, which were still in beta, so stay tuned for our full reviews. By contrast, Canon's Dual Pixel system has the potential to be faster and better, especially for video. Canon says you can now autofocus at light levels down to EV -6, making it easier to capture images in dim lighting conditions. The EOS R is now Canon's second model with eye-tracking autofocus, though you have to be closer to your subject than with Sony's A7 III and A7R III cameras. It has an ISO range from 100 to 40,000, expandable to 50-102,000. That's in between Nikon's Z6 and Z7, but behind the Sony A7 III. Shooting speeds are 8 fps, but with AF enabled, that drops down to 5 fps. Those specs are a bit disappointing, especially compared to Sony's 10 fps A7 III and the 12 fps Z6. While Nikon's Z6 and Z7 are its first ever interchangeable-lens cameras with in-body stabilization (IBS), the EOS R is unfortunately lacking that feature. While you'll get anti-shake features via some of the new RF lenses (though not the 50mm f/1.2 nor the 28-70mm f/2.0) and existing EF glass, the lack of IBS is black mark for the EOS R.
The EVF is a 3.69 million dot OLED model with 100 percent coverage and a 0.76x magnification. Rather than a joystick, you use the right-hand part of the touchscreen to select focus with your thumb when using the EVF. Canon also unveiled a MacBook-like "multifunction touch bar" that you can program for different settings like ISO, shutter speed, autofocus and more. Vloggers and selfie-takers will be glad to know that the 2.1-million dot touch panel has a rotating, flippable display. Nikon's Z-cameras, by contrast, just have tilting touch displays. The EOS R has a dust- and drip-proof magnesium body that weighs 660 grams (1.5 pounds) with a battery, about the same as the Z7 and Sony's A7 III. Much like with Nikon's Z models, it has a meatier handgrip that makes it more desirable for professionals. It uses the same LP-E6N batteries as the 5D Mark IV, which will yield a better battery life than Nikon's Z6/Z7. If you need even more, a battery grip (the BG-E22) is available. Also like the Z6/Z7 and Fujifilm's X-H1, there's a liquid crystal display on top that shows aperture, shutter speed, ISO and other essential settings. Unfortunately, there's only a single SD card slot, but at least it supports high speed SDXC UHS-II, rather than Nikon's more esoteric XQD and CFexpress Type B formats. In my opinion, Nikon overachieved with video, offering 4K with a full sensor readout on the Z6 and 10-bit HDMI output on both the Z6 and Z7. Unfortunately, Canon's EOS R doesn't measure up, despite the company's reputation for video excellence. It shoots 4K at 30 fps, but as with the 5D Mark IV, there's a considerable 1.7 times crop factor. That makes it less useful for vloggers, as you'll need a wider-than-normal lens to shoot yourself (and others) from up close. You also effectively lose the light-gathering and shallow depth-of-field benefits of a full-frame sensor. Canon told Engadget that it went with the crop factor to reduce heating issues on what is a relatively small body. It said that videographers can shoot continuously, even in the desert, without fear of overheating. That said, however, both Sony's A7R III and the Nikon Z6 do support a full sensor readout without a crop factor. The EOS R also shoots 1080p video at just 60 fps, compared to 120 for the Z6, Z7 and Sony's A7 III,, and unlike other models, can not record more than 30 minutes of video continuously. On the plus side, the EOS R does have 4:2:2 10-bit video output externally via the HDMI port (internally, it's 4:2:2 8-bit). That will give serious video shooters more latitude for color correction. It also has 3.5mm microphone and headphone jacks. Like the 5D Mark IV, the EOS R has Dual Pixel RAW, a system that takes two 30.3-megapixel images nearly simultaneously. That changes the way the bokeh looks in out-of-focus regions, and boosts the dynamic range a bit. Connectivity-wise, you get WiFi, Bluetooth and NFC, along with USB-C and HDMI. 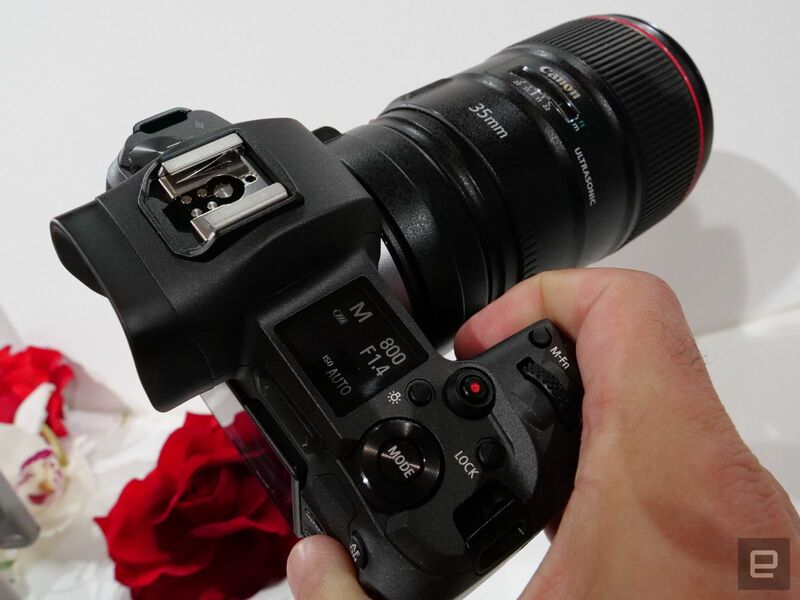 The camera can be charged with the latter while shooting, but you must use Canon's included USB Power Adapter PD-E1. I had a half-hour or so to play with the EOS R with the 50mm f/1.2, 24-105 f/4, and a model with the adapter and an EF 24-70mm lens (stay tuned for a more extensive hands-on). So far, the autofocus seems accurate with moving subjects, and the eye-tracking works well provided subjects are close enough. The EOS R is nice and light, though the 50mm f/1.2 is a pretty heavy lens, and I'd expect the 28-70 f/2 lens will not be a lightweight, either. Not that I'm complaining, though -- those are two fantastic lenses that will be available shortly after the EOS R launches. They let you shoot in low light without resorting to crazy ISOs, though the autofocus occasionally struggled for me wide open at f/1.2. Keep in mind, however, that neither has built-in stabilization, nor does the EOS R.
I have to say that the EOS R seems incredibly solid, more so than Sony's A7 III and maybe even a bit more than the new Nikon Z models. The grip is also nice and fat, something that Canon pro DSLR photographers will likely appreciate. The $2,299 price is more than both the Nikon Z6 and Sony's A7 III (both cost $2,000), and might be a hard sell given the sensor cropping for 4K video and lack of in-body stabilization. The EOS R full-frame mirrorless camera will be available in October, 2018 for $2,299, or $3,399 with the RF 24-105 F4 L IS lens. The $500 EF-M 32mm f/1.4 STM will arrive in September, the RF 50mm f/1.2 L will cost $2,299 when it arrives in October 2018, the RF 28-70mm f/2 lens is $2,999 and comes in December 2018. The $1,099 RF24-105 F/4 L IS USM lens will hit stores in December, 2018. The Canon Mount Adapter EF-EOS R and Control Ring Mount Adapter EF-EOS R arrive in October 2018 with price tags of $100 and $200, respectively. The Drop-in Filter Mount Adapter EF-EOS R hits stores February 2019 at $400 with the variable neutral density or $300 with the circular polarizing filter. 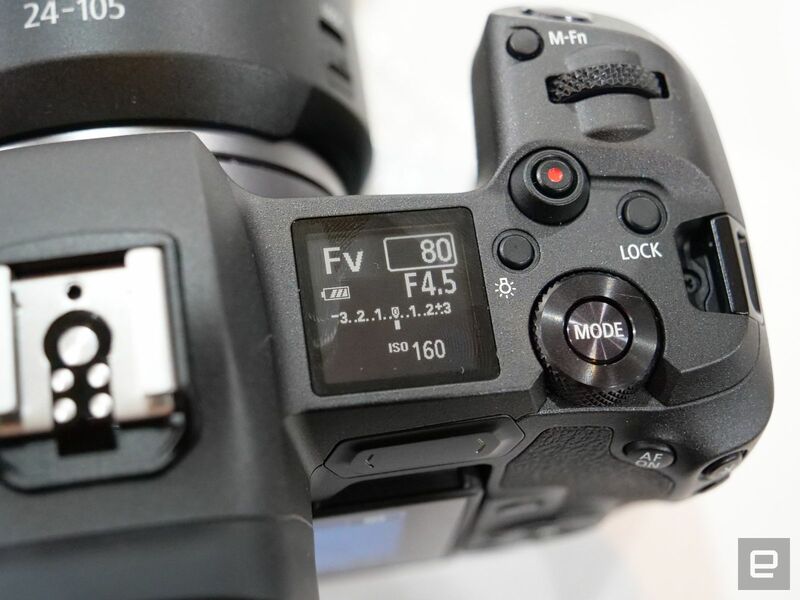 Update 9/5/2018 2:11 PM ET: The article has been updated with information about the lack of compatibility with EOS-M mirrorless cameras and lenses and information about continuous video recording times. It also includes an explanation from Canon as to why there's a 4K video crop factor. On occasion Engadget will accept travel and lodging from manufacturers to test products not yet available locally for review. In this case, Canon had a single North American and European launch in Maui. We do this to make sure our readers have the latest information and expertise about new products. This is often the practice for significant new camera launches. This in no way colors our editorial coverage of the cameras or of the manufacturers themselves.